The Word of God says that if we have the faith the size of a mustard seed we can move mountains (Matt 17:20). The master key to manifesting all of God’s promises in your life is learning how to skillfully grow and use your God-given faith. 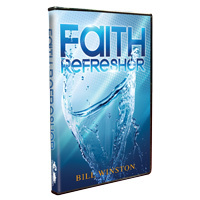 In this special teaching compilation taken from the 2013 Faith Refresher, Dr. Bill Winston shows you how to develop and use your faith to conquer any obstacle and move any mountain that tries to stand between you and God’s destiny for your life. Let the revelation shared in this series help you to boldly go forth and witness the power of the Kingdom of God in your life like never before. It is time for your faith to be refreshed!